Lady Mirabella Tirel, the beautiful daughter of the Marquess of Camarden, takes a practical approach to love since a dashing captain broke her heart at age 17. Now at almost 22 years old, she has decided to endure one last London season to secure a suitable engagement and begin a simple life in the country. Sir Giles Knyvet is Mirabella's oldest friend and her most dependable ally, and he is also secretly in love with her. Yet he knows the prospect of a relationship is doubtful: Besides being a mere baronet, he aims to settle a large family debt before sharing his feelings with her. But as Mirabella draws close to a suitable match, Giles may need to interfere to buy himself more time. A Sapphire Season is set within the Regency era; an era within which I can claim no expertise. I couldn't even begin to tell you whether the clothes, food, conversational topics, entertainments, and courting rituals are period correct or not. I can tell you that they felt that way. Many of the period terms were unfamiliar to me. More than once I have been grateful for my ebook reader as all that I need to do is click on a word and it will instantly provide me with a definition. I find that I am far more likely to discover what an unfamiliar term means when I don't have to go hunt for it in a dictionary. There is great value in the exercise of learning new terms and the convenience of the quick dictionary access means that I will investigate it, for which the book proves richer. When giving my opinion on this book it must be tempered with the understanding that this is not a preferred genre of mine. Every once in awhile I will pick up a book of this nature and be reminded again that I like these books primarily because they are light and breezy; I dislike them for their predictability and that they are often vapid. A Sapphire Season revolves around Lady Mirabella who is a kind hearted young lady and a true friend. She has decided that she is going to announce, via the ever successful method of good gossip, that she is seeking a marriage partner during the London social season. Mirabella will turn twenty-two during this season, her fifth, which is verging on the edge of being considered an old maid wherein marriage prospects will decline. She is fully desirable in position, beauty, deportment, and wit but had removed herself from the marriage market due to an earlier heartbreak. She has come to believe that she cannot obtain a love filled marriage and so is seeking the alternative; an amenable husband with good prospects. What her mind believes is at war with her heart. Lynn Morris writes cleanly, articulately, and enjoyably. Giles and Lady Rosalind FitzGeorge were my favorite characters. Giles for his patience, honor, and strength. Lady FitzGeorge for her unconventional and fun manner. This is marketed as a Christian fiction book. I did see a few references to God which toward the end become a bit more pronounced but I don't see the characters, particularly Mirabella the protagonist, as an example of a true believer in the Savior, the Lord Jesus Christ. This book leans towards a modern American degradation of the gospel; it presents a weak understanding of what it means to trust in Jesus and walk with Him. It smacks a bit of the prosperity gospel which, in an incredibly over simplified description, means that it assumes that if I follow Jesus then I will get what I want out of life. This makes the assumption that God’s purpose is for making my life better instead of God creating me for the purpose of serving Him no matter the outcome or cost. It assumes that God’s love toward me is to have my life filled with peace and joy in having life turn out the way I want. It is forgetting that God calls us to peace and joy even in the midst of trials and in fact, this is how our perseverance in faith is proven. He created us solely for the purpose of worship. 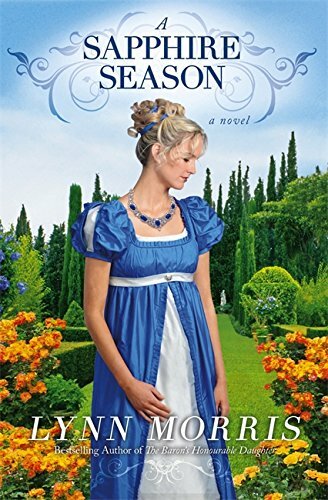 Overall I found that A Sapphire Season followed the story lines of Christian love stories perfectly, which is a negative for me. On the positive side, Lynn Morris has a writing style that is clean and the story has a good flow. It has very likable characters and some delightful repartee. It is a quick and light read that is good for a lazy, relaxing kind of day.